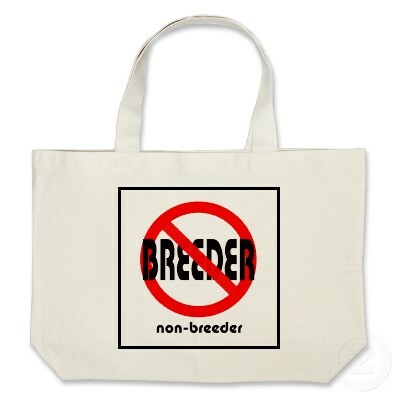 Some people hate the term “breeder.” Mostly it’s breeders that complain. To me a breeder is someone who chooses to have children and a non-breeder someone who does not. I’m a non-breeder and think it’s a funny title. You are welcome to call me a non-breeder even to my face. Also The Breeders happens to be the name of one of my favorite bands, so named because the term “breeders” is gay slang for heterosexuals. Interesting, right? 1: slang term used by some childfree people for one who has a child and/or has many after that, refuses to discipline the child/ren, thinks the sun rises and sets for their child/ren, look down upon people who do not have children, and are in general very selfish and greedy when it comes to their whims and those of their child/ren, especially if they can use their parenthood status or their children as an excuse to get their way. So why do we need labels like breeder, non-breeder, childfree, non-parent? Do names and labels hurt or discriminate? What do you think breeders and non-breeders? Are you loud and proud?